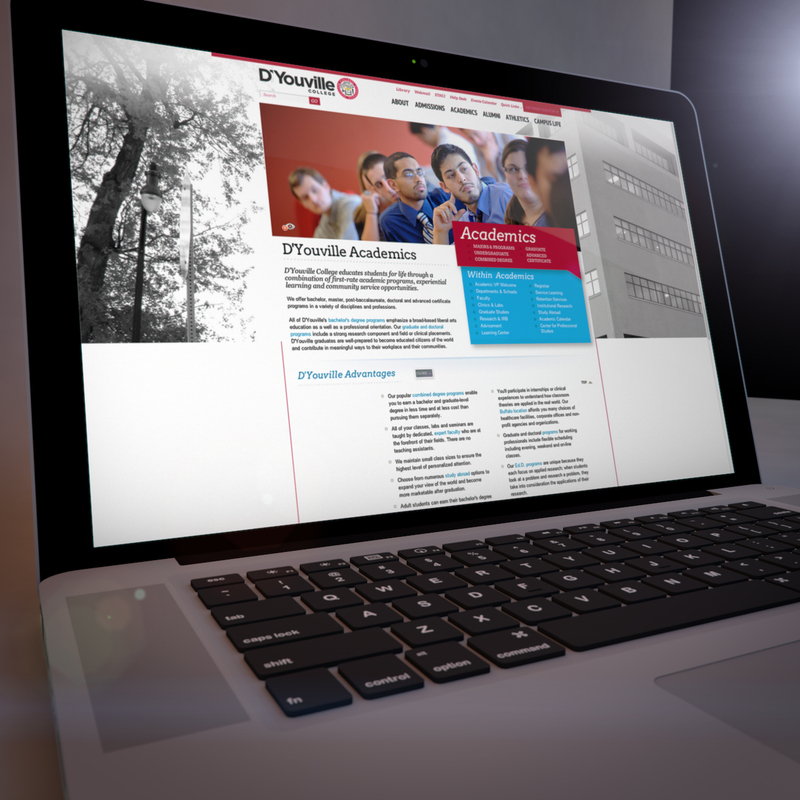 D’Youville College sought a university marketing partner to perform a complete website redesign that would work with their new Omni Update CMS solution. 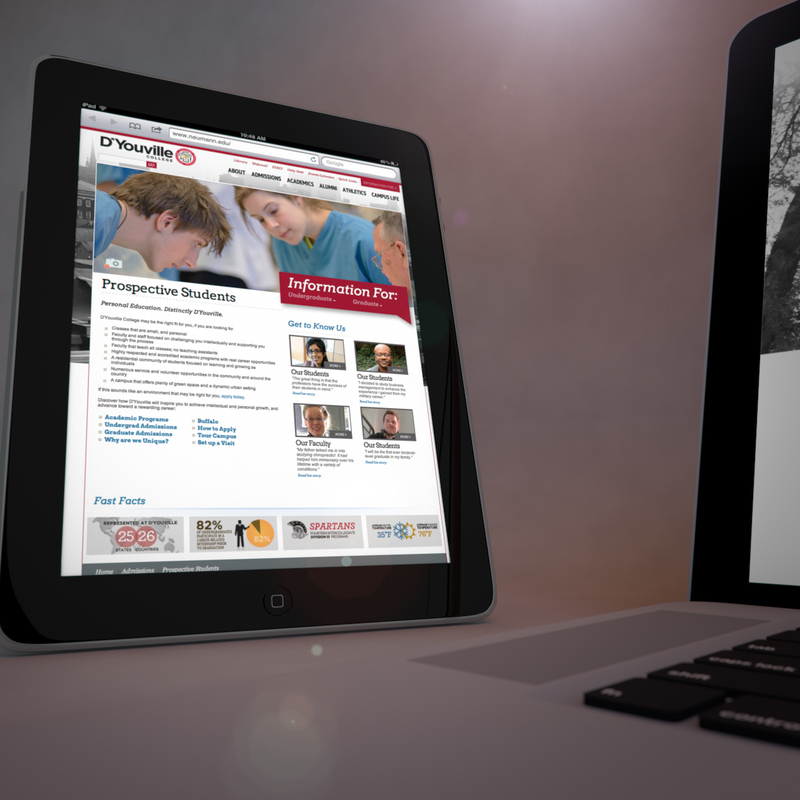 With our portfolio of higher education website designs, PS&L earned the project. Not unusual, an unexpected event occurred after the project was initiated. Early within the research and discovery phase, a branding initiative took place to create new graphic representations of the College’s emerging brand. We were flexible and accommodated the change of pace of the project as the new brand images were incorporated into the interface designs. Part of our website assessment responsibility included looking closely at how the new website was to be managed, the workflow, and the staffing needed to maintain the site. The College adopted our recommendations. We worked with new and existing staff in somewhat different roles to move the project along. In addition to our normal six phase process an additional component was added; one hundred pages of copy for first and second level pages. To stay on deadline and manage the sheer load of 100 additional pages, we began the copywriting process immediately following the research and discovery phase. This allowed us to develop copy and submit to constituents for review, comments, and approval while we worked on developing the rest of the site. From the research and discovery phase, through copywriting, design, and testing, PS&L and the D’Youville staff worked collaboratively to bring the college’s website into the final phase of the redesign. This collaborative approach created an environment where faculty, staff, and administration across campus are heard at several junctures, which has secured a sense of buy-in amongst internal stakeholders. Our process and approach also gives the college staff a high level of comfort in managing and maintaining the new website. As part of its rebranding effort D’Youville College launched the new redesign of its website.One of the goals was to increase enrollment by attracting Canadian as well as U.S. students. The new website incorporates a sophisticated design, integrates with the College’s social media marketing, and is managed with a robust content management system (CMS). D’Youville is an independent Catholic college located in Buffalo, New York. Founded by the Grey Nuns in 1908, D’Youville offers undergraduate, graduate and professional degree programs in allied health professions, education, business, and liberal arts.